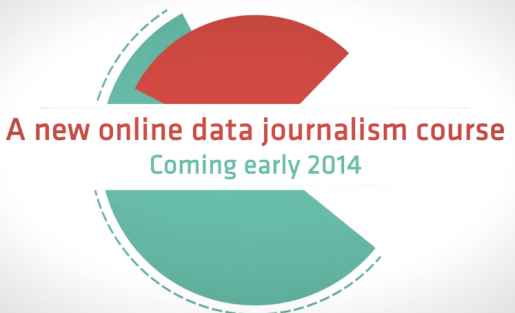 The European Journalism Centre last month announced its first MOOC (massive open online course) on data journalism. Our media environment is increasingly saturated with data — from large collections of leaked documents, to public databases about lobbying or government spending, to “big data” from social networks such as Twitter and Facebook. As a result, journalists are increasingly required to manage data science in addition to journalism to be equipped with the skills that are increasingly required for jobs in the 21st century newsroom. To help journalists to acquire these abilities, last month the European Journalism Centre announced its first MOOC (massive open online course) on data journalism. The course aims to give participants the essential concepts, techniques and skills to effectively work with data and produce compelling stories under tight deadlines, and is open to anyone in the world with an Internet connection who wants to tell stories with data. "Journalists are increasingly required to manage data science in addition to journalism to be equipped with the skills that are increasingly required for jobs in the 21st century newsroom." The announcement was met with much excitement. Now, more than three weeks later, over 6,000 participants are signed up for the course. Almost half of those who have registered are journalists, and others include communications professionals, programmers, graphic designers and statisticians. So far, we have had course registrations from more than 170 countries all over the world — from Afghanistan to Albania, Bangladesh to Botswana, Cambodia to Cameroon. Registration is still open, and if you’re interested in joining, you can sign up here. We want to give journalists interested in learning these much-demanded data skills the opportunity to learn from the best in the business, so we have assembled a group of course instructors and advisers from leading outlets and journalism schools, including the Walter Cronkite School of Journalism, the New York Times, ProPublica, Wired, Twitter, La Nacion Argentina, the Chronicle of Higher Education, Zeit Online, and others. The selection of instructors and advisers from four continents was also guided by the desire to create a course that is useful to journalists from any part of the world by recognizing the differences between media environments in different countries in our materials. The course has been inspired by and builds upon another resource that we produced together with the Open Knowledge Foundation last year — the Data Journalism Handbook. The handbook captures and translates the experience and expertise of over 70 of data journalism’s leading advocates and best practitioners in a collection of tips, techniques, stories from the field, case studies and tutorials. The book takes the reader through data journalism operations in various newsrooms around the world and through all the steps of the data journalism workflow, from getting data, to understanding it and presenting data stories to the public. Authors include experts from the New York Times, the Australian Broadcasting Corporation, the BBC, the Chicago Tribune, Deutsche Welle, the Guardian, the Financial Times, La Nacion, ProPublica, the Washington Post, the Texas Tribune, Zeit Online and many others. One year and a half after its launch, the book is so far available in Spanish, Russian, French and Czech and translations in many other languages — including Chinese, Arabic, Portuguese, Georgian and Macedonian — are coming soon. We hope that these resources will enable more journalists to use data in the service of journalism. As the practice of data journalism spreads around the world we also hope to see more collaboration on data-driven investigations across borders and the establishment of a global data journalism association, which would enable the exchange of datasets, experience and resources among journalists. An excellent report on an important initiative. Now we need some public outreach to assist journalism’s audiences on how to receive data-rich reporting. Up till now, the complexity of the information era has driven them to FOX and other anti-data news sources.